The day dawned sunny and beautiful. Dawn patrol (James and I) exercised Juneau and talked muffins. But, then everyone woke up and we decided to keep it simple, so we went with a big meat breakfast. Never a bad idea. There was some fruit involved too. Kids hit the pool. Mich and Gray organized tie dye, a CAB must. Lunch was al fresco. Afternoon activity was a visit to Swallow Valley Farm (.com for their website), where we planned to pick strawberries (organic!). The strawberries were growing under plastic tunnels and it was so hot in there. Our goal was to pick 12 baskets full, but we pooped out at 11. We just didn’t have it in us. As the boys lounged in the car, the girls and I headed up the hill to see the pigs and sheep. The pigs were very interested in us, came running over to the fence, grunting, and being friendly. Nice. The sheep, on the other hand, were cold and ran the other way. Meanwhile, the boys were apparently being taunted by one of the farmers and goaded into eating a jalapeno. When we got back to the car, Vince was spitting and told us he and James were now men. Fortunately we have a firm policy to never clean anything out of the car, so we had oreos, uncrustables, cheese crackers and juice boxes from yesterday. A feast. That helped. Next we headed up and over the ridgeline to check out the new pond. The owner of the land is building a new house there too. The pond is beautiful, set in the hills in a perfect spot. The edge was pretty muddy, but we liked letting it ooze between our toes. People pay good money for mud treatments. Teeny frogs were swimming around, doing killer frog kicks. The water looked inviting, and we were hot and sweaty from physical labor and jalapenos, so… But, we hesitated. So, I incentivized the campers, and James and Vince took the plunge in their boxers. Mich and Gray were not far behind, fully clothed. I was considering taking the plunge, when I slipped in the mud and swan dived in. It was great. The campers swam across the pond, and then circumnavigated the thing. Meanwhile, a super cool dog was running around the pond with a ball, which we tossed for him. Wow, super cool. The owner gave me and Vince a tour of the house. Really nice. We were the first people to swim in the pond, and he was happy about that. He took a phone call while we were there, and I heard him call us “a beautiful family.” You got that right mister. Yeah, I know, eavesdropping. But, it’s a cavernous house, and I could just hear him. He is an anthropologist, specializing in Mayan cultures, professor at UC Irvine, retired. 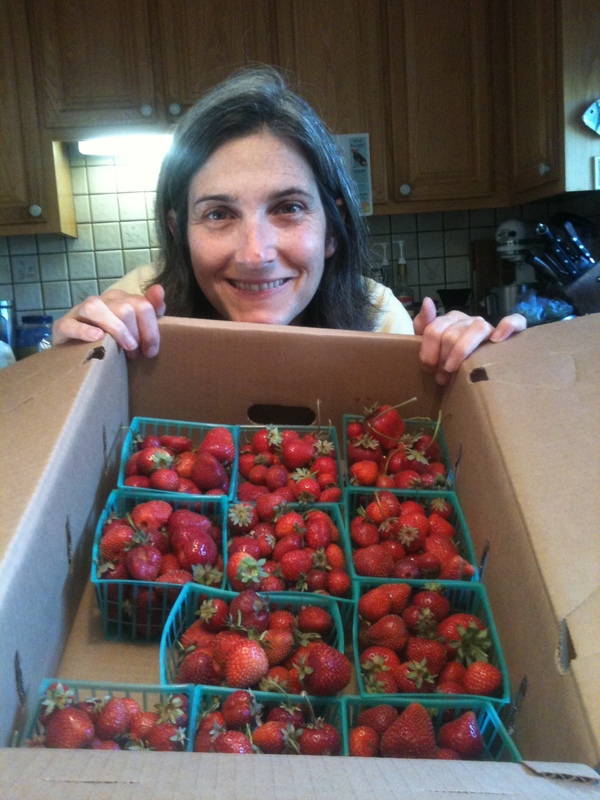 We stopped on the way out of the farm to get some eggs and pay for our strawberries. Exposing the campers once again to the honor system. Eggs and money in a cooler by the chicken coop. At home, the kids were back in the pool. I made a chiffon cake to eat with the berries, and prepped the make your own pizza set up. Paul and girlfriend Maile showed. So exciting. They hung with us all evening. Cause we’re hip. Nighttime hot tubbing under the stars. Frank discussions about drugs and school. I gave my standard “do your own thinking” talk. Don’t be a follower! They all strike me as level headed and wise. Unlike AB who got suckered into renting Pineapple Express. I know. Most of the campers fell asleep almost instantly. Vince saw a good half. It’s midnight and they are asleep, recharging!!! I gotta go. P.S. I am aware that all that talk of muffins and meat could be misinterpreted. Unintentional. Get your minds out of the gutter. Just wanted to be sure that you know that I know that you know that I know. Touche. This entry was posted in Camp Aunt Betsy (CAB), Summer 2012, Uncategorized. Bookmark the permalink.